comfort to every charter guest. plenty of seating and panoramic windows. Her garage is bursting with toys, including 2 Jet skis and 4 sea bobs, and her spacious swimming platform also doubling as a beach club. 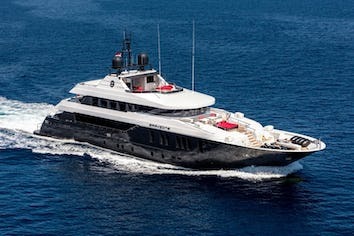 guests’ needs are exceeded while on board this prestigious yacht. Please note that current photos show the yacht before the 2018/19 refit. Photos of the cabins on the lower deck are rendering of how the yacht will actually look like. Updated photos coming soon. Daniel is a very experienced seamen, whose passion for the sea has always been very strong. He started as a Deck Cadet on mercantile and passengers ships, fast becoming 2nd mate. Then he decided to move to the yachting industry where he reached the grade of First Officer and after 4 years he became Captain. He has an excellent team-leading skills and is very able to coordinate his crew. He loves travelling and discovering new places and he’s fond of fishing. Tough – minded and determined, Daniel accepts any new challenge as a way to self-improve. His extensive knowledge of the Mediterranean coasts allows him to plan perfectly tailored itineraries and to make his guests’ holiday truly unforgettable. Italian mother-tongue, he also speaks English and a basic French. Gabriele is a very skilled young chef with an extensive experience. He took a diploma as Food Technician and then left for his Military Service in the Navy. 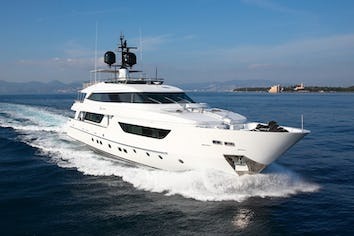 Here his passion for the sea grew stronger and he decided to deepen his culinary skills through a series of professional courses to get a job on pleasure yachts. He attended the “Typical Italian Cuisine”, “Bread and Patisserie” and “Indonesian and Balinese Cuisine” courses and he worked for several years in important Italian restaurants until he became Head Chef. Then he got all the necessary maritime licenses and embarked on very large yachts. He has a very dynamic approach to work, he’s specialized in Italian cuisine but he loves to experiment with fresh seasonal products, according to the guests’ tastes and preferences. He’s also very skilled in cooking sushi and sashimi and his cakes are heavenly! He speaks Italian, English and basic French. Giacomo is a very hard-working, motivated, reliable person. A good team player, he’s friendly, active and with a strong sense of responsibility. He attended the Nautical Institute in Viareggio, alternating studying with seasonal jobs on board private and charter yachts. In the last three years he has worked as a First Officer on commercial vessels and in 2019 he joined Cloud Atlas team. He’s a master of hospitality, always trying to anticipate his guests’ needs still being very discreet. Italian mother-tongue, Giacomo also speaks English. Andrea is a very smart and efficient Chief Engineer with over 10 years’experience in the nautical field. Born in Genoa, he studied at the Nautical Institute and began his career on a cargo ship when he was only 19 years old but in the meantime he kept on studying and at the age of 23 he graduated as an Engineer Office. In 2013 he embarked on cruise ships as 3rd Engineer and in just 5 years he became Junior 1st Engineer. His long experience and his passion for his work grant guests a safe and smooth cruising. He loves all sports, motocross in particular, and he’s a master in managing water toys. Italian mother tongue, he also speaks English. Cesar is a very friendly and efficient Bosun. He really likes his job and he believes in constant self-improvement that’s why he’s always ready to learn everything from every experience. He loves working with people from different backgrounds and cultures and he’s always willing to help his guests feel like home. 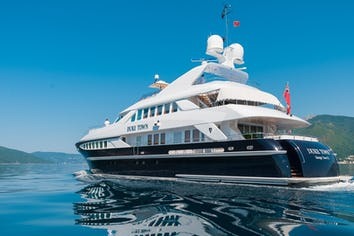 His long experience on very large yachts covered many areas: he’s particularly skilled in managing water toys and in supervising winter yacht maintenance. He speaks Italian, French, English, Spanish and Filipino. Valentina is a naturally warm and friendly stewardess, particularly skilled in creating positive relationships with colleagues and guests alike. Very calm and a real problem-solver, Valentina is great at motivating the crew and at keeping the yacht in perfect conditions. She has an extensive experience as a yacht stewardess and she developed so many additional skills like decorating, flower arrangement, cooking etc. Plus, if you’ll have a celebration on board, you’ll notice Valentina’s incredible ability in party planning. Italian mother-tongue, she speaks English German, French and Spanish. Ely was born in the Philippines and he perfectly embodies all the values and characteristic of his native culture: calm and discreet, he’s a hard worker and he’s super kind, always offering his help with a huge smile. He started working in the yachting industry because he’s always been passionate about customer service and he’s particularly skilled in dealing with people from different nationalities and backgrounds. Attention to details is one of his most appreciated characteristics and he never fails to put his guests at ease. Ely speaks Italian, English and Filipino. Paolo is a very enthusiast person, always smiling and willing to help. He has a life-long experience as a deckhand on sailing yachts and recently moved to motor yachts. He opted for a maritime career to foster his passion for travels and life at sea and never regretted this decision: he has the opportunity to travel the world and meet new people every day. He’s a very open-minded person, a hard worker and a very pleasant company for a chat. Italian mother-tongue, he also speaks English. Beatrice started working in the tourism sector at a very young age and gained plenty of experience in luxury hotels and fine restaurants. She also has a passion for cooking, that’s why she attended several cooking classes and she’s great at plating too. Attention to details is one of her most appreciated characteristics and she never fails to put her guests at ease. Guest-oriented and a great team-worker, Beatrice loves dealing with people from different nationalities and backgrounds. She has traveled extensively, she’s always willing to learn new things and tasks and she has a very cheerful and outgoing personality. Italian mother tongue, she also speaks English.